I love the medicinal mushrooms. They are always there. There is no need to consider the weather being just right like you would with field mushrooms, morels or chanterelles, etc. All you have to do is be in the right place. If you are and know enough varieties you will never be skunked on your mushroom forays - ever. When you do go on a foray the more varieties you know the better chances you have of bringing something home. Here is a mushroom to consider adding to your list of desirables. A couple of healthy tinder conk. Note the nice white leading edge. It is common in this area, as are dead or dying beech and birch trees, a couple of the tree hosts upon which it grows. It is also found quite regularly on other trees such as maple, cherry, hickory, tulip poplar, aspen and others. It is quite common in southwestern Pa. Although it is not eaten - it is much too hard even after cooking - it is a medicinal that people process and use. The tea-like infusion has no disagreeable taste. In addition to it's use as a medicinal this fungus has several other uses. 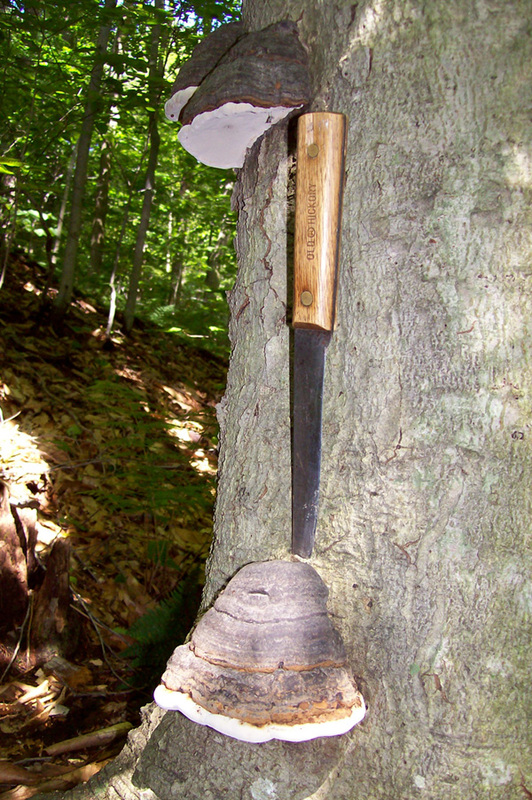 A knife blade shoved in near where the fruit body attaches itself and a little leverage and off it comes. Can you believe that a cloth can be processed from a portion of the fungus. A cloth that is super-absorbent and felt-like. A cloth ( amadou ) that will absorb every bit of moisture from an overly used, sopping wet dry fly so that in just a few compresses between such amadou layers it is again bone dry so that dry fly dressing can be applied to it again and immediately put back in use. Articles such as hats, bags, purses and other clothing items have been fashioned from this amadou. That same cloth is also a great tinder - spark catcher, when properly processed. Primitive people utilized it in at least two fashions - tinder and medicine. Tinder hoof is a perennial fungus. As long as the substrate has the nutrients it needs it will continue growing adding a pore layer each year. It's surface is hard, generally a brownish color with a bit of gray while still actively growing. As it ages it gets grayer and grayer eventually attaining a blackness. Pores are an off white - off cream color. Sort of like a dirty white tee-shirt. Generally the size can get a little bigger than a grapefruit half. Odd shapes can be found. Some grow long. Some grow wide. Some grow thick. Pores are light cream color when young tending to develope toward dark cream, then light tan, then light brownish, etc. The pores darken when handled. The lighter the hue of the pores the younger the fruiting body. Some different shapes and sizes of tinder conk. The mushroom is also geotropic. It grows DOWN. You will occasionally find trees that have fallen where tinder hoof has been growing. While the tree was erect the pore surface faced down. When the tree fell the mushroom made adjustments. It began growing in the direction that would keep it's pore surface oriented downward so as a result you can find some weird looking mushroom shapes. 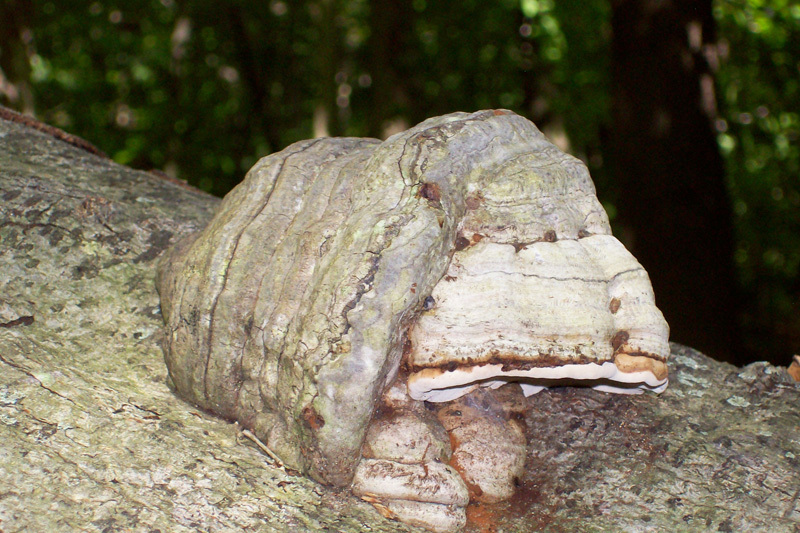 Here is an example of a tinder fungus that readjusted it's growth direction. In my area, southwestern Pennsylvania, you can harvest many of the medicinal mushroom species that the vast majority of people don't bother with. Mushrooms such as chaga, turkey tail, lingzhi, hemlock varnish shelf, birch bracket, split gill, gilled polypore and tinder fungus, just to name a few, are easy pickings. The people that I associate with includes a few that do collect some wild mushrooms. But even those few do not know those mushrooms. Unfamiliarity with the use of those medicinal mushrooms is common, even by many people that enjoy wild mushroom foraging. That's why there are always some of those mushrooms available. They are just not overpicked. It's a shame really that they are not utilized, but what the heck - more for me. If you are considering picking some tinder hoof for medicinal purposes, such as a tea-like infusion or a broth for soups and stews, I would recommend that you pick the smaller ones. They are generally more pristine. they have just a hint of softness which makes them just a little easier to slice up for drying. A demonstration of a good size to use for medicinal purposes, although this is a beech tree. 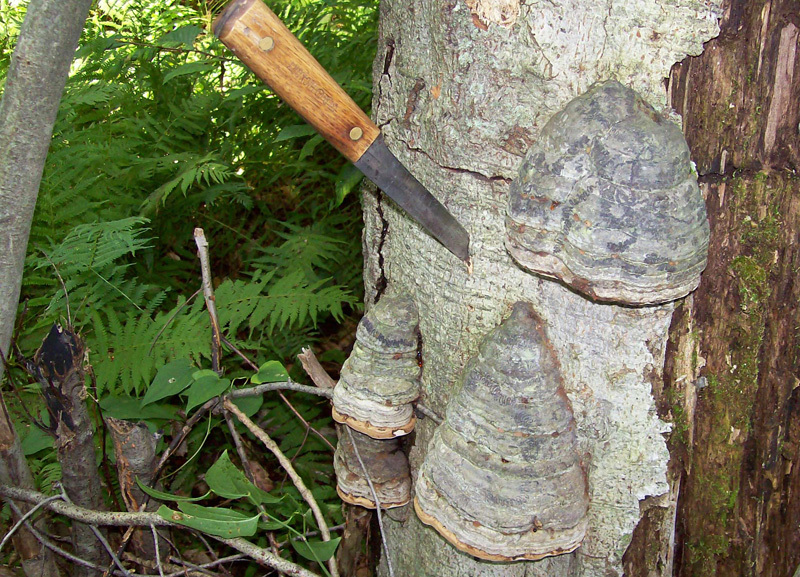 It has been confirmed through scientific analysis that there are two distinct types of tinder fungus, genotype A and B. The way to distinguish the two genotypes out in the field is to determine what tree species that it is growing on. If growing on birch it is genotype A ( that's good ). These are perfect for picking - young, fresh and clean genotype A beauties. 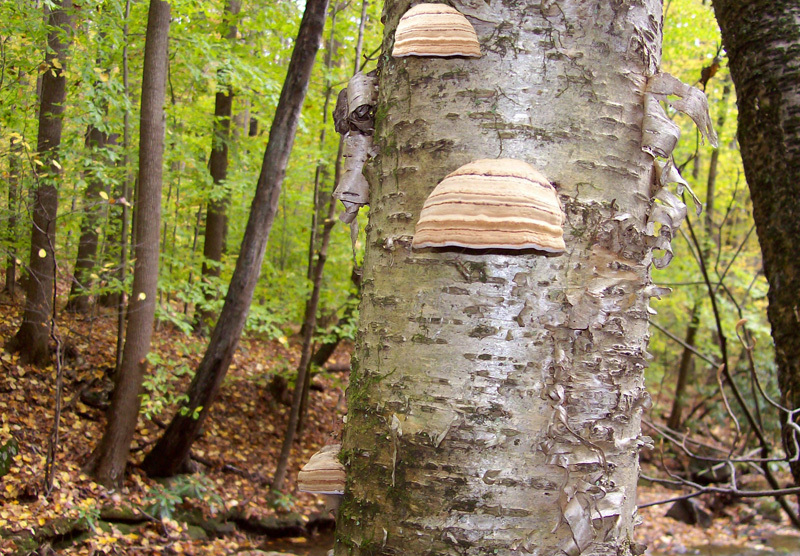 It is probably best to use those tinder fungus mushrooms that grow on birch trees ( my theory ). Birch tree bark contains betulin and betulinic acid ( that's good ). 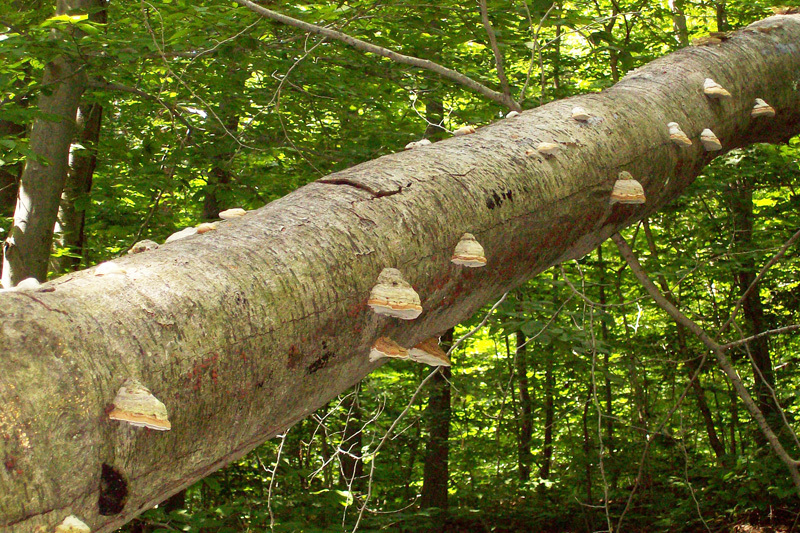 My thought is that the tinder fungus mushroom growing on birch trees will have some in it's makeup. It has been scientifically confirmed that chaga does convert betulin ( which is wasted in our body because we can't assimilate it ) to betulinic acid which our bodies can. The way I figure it is that if I am going to pick these for making infusions, broths and/or tinctures I might as well get those growing on birch. A tea-like infusion or broth will look like coffee or black tea. It tastes agreeable, sort of like black tea or black coffee does ( that's good - if you like black tea or black coffee ). 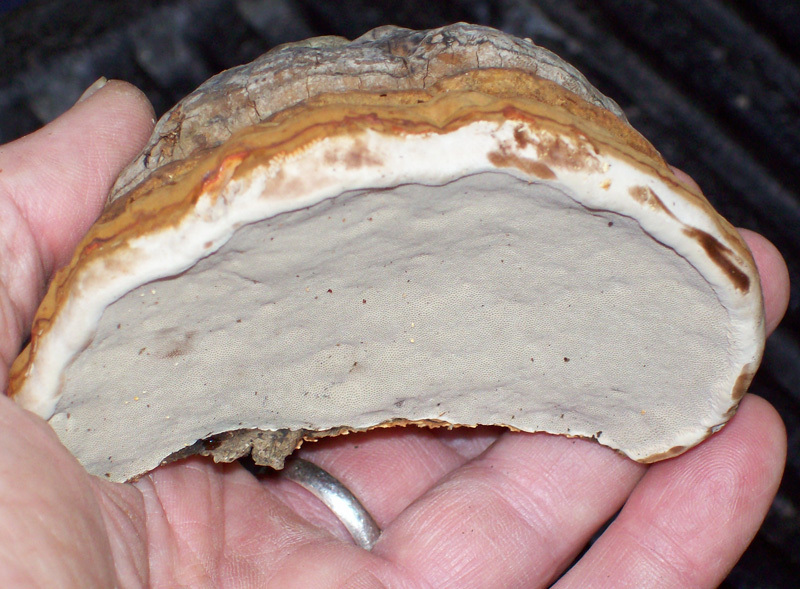 You can get a little more flavor if the tea you make is made from the genotype A tinder fungus. But that's just my opinion. I use the infusion regularly to mix with an equal amount of turkey tail infusion and an equal amount of chaga infusion. The mixture stays in a 59 oz. orange juice jug in the refrigerator. I use it to make my Folger's Instant cup of coffee each morning and evening. I go through a 59 oz. jug every week. 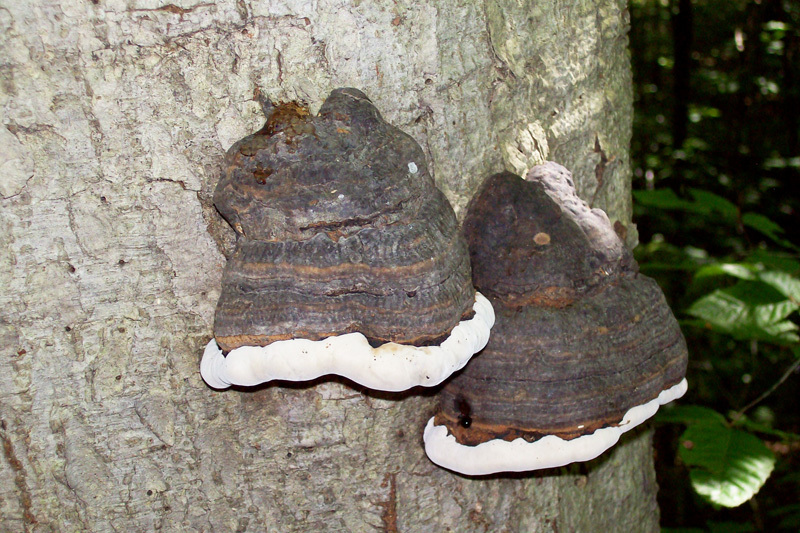 Anti-infective properties of the melanin-glucan complex obtained from medicinal tinder bracket mushroom, Fomes fomentarius (L.: Fr.) Fr. (Aphyllophoromycetideae). DATE - Throughout the year. FOUND - In the Laurel mountains of Westmoreland County and Somerset County. I find it on beech and birch most often but also on many other trees on occasion.